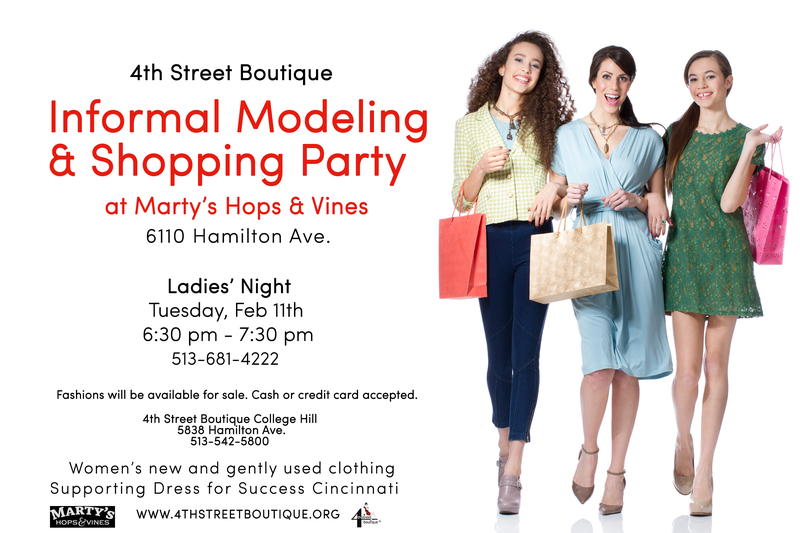 4th Street Boutique Event at Marty’s Hops & Vines February 11! If you want to treat yourself to a little retail therapy, 4th Street Boutique is here to help you out! They’ll be having an informal modeling and shopping party event at Marty’s Hops & Vines on February 11 during Marty’s Ladies’ Night. The night will include a presentation of Dress for Success Cincinnati, live models wearing 4th Street fashions and styling tips. All of the fashion’s you’ll see Tuesday will be for sale. Check out more by clicking here! Previous PostPrincess Diana Exhibit Coming to Cincinnati February 14th!Next PostIvy Costa Launch Party February 20!